This past weekend was the Santa Fe Century (and Half Century) bike ride, part of Outside Bike & Brew weekend. We could not have asked for more perfect conditions for the entire weekend of events! 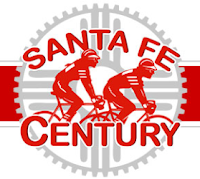 Friday and Saturday featured bike exhibits, live music, a local beer festival, family events, and guided group rides, followed by the 31st annual Santa Fe Century ride on Sunday morning, along with an Enduro race in Glorieta. Jaycob and I both rode the 50 mile course on Sunday. Our 4-legged daughters have some news to share... Our little family is growing! We are expecting a baby in early November! I will be 16 weeks tomorrow and things are going very well. We are a few weeks into 2nd trimester already, and all my labs and screening tests have been normal. Baby is on track with his or her growth and we are low risk for complications at this point. I think Jaycob and I both felt a little cautious during first trimester but stayed hopeful, and we grow more excited each week to welcome this new joy into our lives! I envision this little life and look forward to experiencing motherhood and the overwhelming and unconditional love that comes with it. Baking with booze has the potential to add an entirely new flavor and sweetness to desserts. Alcohol can be substituted for extract in many recipes (bars, cakes, bread, brownies, cookies, etc.). Bourbon, Bailey's, amaretto, and dark rum are popular additions, but honestly you can bake with everything from flavored vodka and Bacardi to tequila and cointreau. Wine and beer make great additions to certain recipes too. Boozy desserts also appeal to the adult crowd! While a hard cider apple pie may not be appropriate for a child's birthday party, my 30-year-old friends who brew their own beer are all about it. 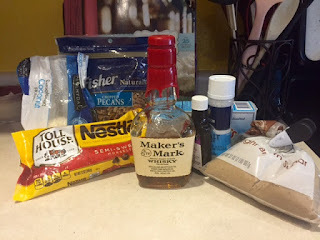 In honor of Kentucky Derby season, I bring you Bourbon, Pecan, Coconut & Chocolate Chip Cookie Bars. With brown sugar, coconut flakes, pecans, and Kentucky Bourbon, these are not your average blondies. Hope you enjoy these as much as we did! My book club is 7 months old and going strong! We have 4-6 dedicated members representing a wide range of perspectives and contributions. One of the highlights of my month is getting together for wine, snacks (cheese is always a staple of our diet), and conversation with my friends who have a shared love of reading. We don't have a theme, and we read everything from nonfiction and self-help to historical fiction and futurism. My favorite book so far has been Fates and Furies by Lauren Groff, a thought-provoking and honest portrayal of marriage and the secrets that define a person.